Midway into the Winter transfer window, and its time to analyze the transfers that have taken place so far.. The Winter transfer window started off with a bang, with Samir Nasri, Dominic Solanke and Nathaniel Clyne among the early confirmed transfers, but since then it has been a very quiet first half of the transfer window. Since then, the transfer window has picked up pace, with AS Monaco signing in numbers while FC Barcelona have picked up another French defender. Cesc Fabregas had a lot of offers on his table. China and USA wanted him and were prepared to offer more money that what the Thierry Henry managed AS Monaco were offering But the Spanish playmaker was determined to find the next big challenge, something which would push him to his limits and bring the best out of him. The move to AS Monaco certainly ticks all the boxes. Monaco are in deep deep trouble. They are 19th in the table, 3 points away from the relegation play-off spot (18th) and 4 points from safety. Half their first team players are injured with Henry struggling to even name 7 players on the bench. 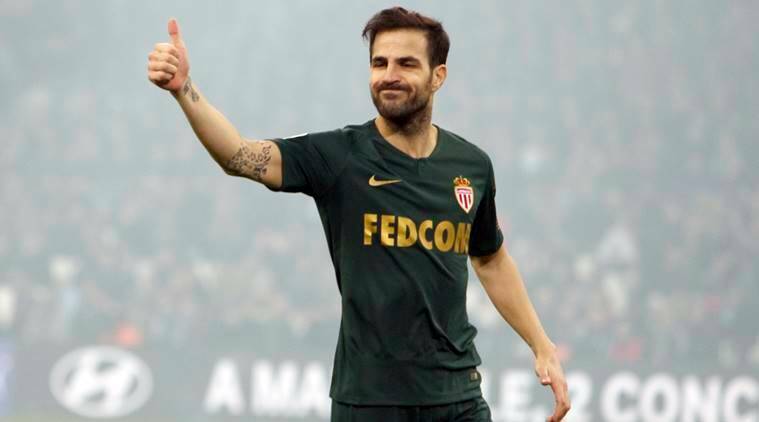 While Youri Tielemans, Aleksandr Golovin, Radamel Falcao, Kamil Glik and Rony Lopes all on the mend and playing again, the arrival of Cesc Fabregas would be a welcome boost Henry will be banking on to turn things around and ensure another season in the top flight for Monaco. Jeison Murillo to FC Barcelona was announced a good number of days before the Winter transfer window, although it was made official on January 1. Murillo is an interesting signing by FC Barcelona, given that he has only appeared in 1 league game throughout the first half of the 2018-19 season. Murillo himself came from Inter Milan on a permanent deal just this summer, making his lack of first team action all the more baffling. From Barcelona’s perspective, the signing of Murillo was almost forced onto them with Samuel Umtiti and Thomas Vermaelen struggling with injuries while Gerard Pique has been struggling to play the full 90 minutes. With Clement Lenglet being the only first team defender, the arrival of Murillo is a timely boost to this threadbare defense. The amount of hype developed by Lucas Paqueta’s move to Milan has been compared to that of Kaka, with the player himself playing as a No. 10 behind the striker. Paqueta has already been capped by the Brazilian National team and his acquisition by Milan is seen as a big coup at €35M. The Brazilian started his first game for the club in the Coppa Italia against Marco Giampaolo’s Sampdoria. Paqueta was brilliant on the ball as well as off it, making brilliant runs and picking up interesting pockets of spaces. While his hard-working performance was not rewarded by a goal or an assist, he immediately took to the San Siro crowd like a duck to water. The early signs are very promising from the Brazilian attacker and it is already looking like an extremely shrewd piece of business. Brahim Diaz, one of the brightest prospects in the Manchester City academy, has followed in the footsteps of Jadon Sancho to move abroad. What is interesting is the club he has landed in, Real Madrid. Diaz has been offered a contract whose value is two times the contract offered by Manchester City. With sporadic first team minutes coming in cup games, Diaz decided to move in search of regular minutes to a club which is struggling with injuries and looking for a player to fill the void created by Cristiano Ronaldo’s departure. Isco has fallen out with Solari, Marco Asensio is injured while Vinicius Jr. is still a raw talent. At 19, Brahim Diaz has quickly forged a reputation of being an exceptional dribbler with quick feet matched by deadly finishing. He could be just the inspirational signing that could make him a Santiago Bernabeu favorite, cementing his place in one of the best, yet out of form, team. Chelsea had a problem on their hands. Willian and Pedro were in their 30s with their contract expiring in 2020. Eden Hazard had also failed to commit to Chelsea flirting with Real Madrid. They needed a young and talented star who could replace at least one of the above three, have a superstar profile attached to him and the signing should also make marketable sense. Christian Pulisic was the complete package. Pulisic has been one of the most consistent performer at Dortmund over the last two seasons. So in the summer, Chelsea struck a deal with Dortmund, making sure he signs with them in 2019. Atletico Madrid made a strong enquiry for the USA international, but were told that a Premier League club had already secured his signature. This meant that the previously indispensable Pulisic started sitting on the bench more regularly, while other youngsters like Jadon Sancho and Jacob Bruun Larsen got more minutes to ensure smooth integration into the first team so that they could replace Pulisic when the time came. Thus, Pulisic has gone under the radar this season, but that does not mean in any sense that Chelsea have overpaid for his services. Pulisic has opened up the United States market for Chelsea. He is perceived as the Messi of USA. Pulisic brings terrific wing-play and playmaking capabilities to the team along with decent finishing. At the age of 20, Pulisic is only going to get better and with more than 110 professional appearances for Borussia Dortmund along with 23 international caps before the age of 21, Pulisic is no raw talent either. Thus, the signing of Pulisic has got to be the best bit of business of this Winter transfer window. Did we miss someone out? Interested in reading more such blogs? Download the indifoot app or go to the indifoot website and follow us on twitter, facebook and instagram to stay up to date with all the latest football news.